Below are some of the conservation issues in our territory (the San Gabriel and eastern San Fernando Valleys). They are in various stages of planning and development. Some are open for hearings and comments. Some are not and are listed here for reference only. If you know of others or if you know of meetings dates, please contact us and we will update this page. The order in which items are listed does not necessarily indicate priority. When: Tuesday, December 11, 2018, at 9:30 a.m.
You've probably heard or read about the presidential Executive Order of April 26 threatening the preservation of lands within National Monuments. The order directs the Secretary of the Interior to review all NMs over 100,000 acres established through the Antiquities Act since 1996, in order to determine if “abuses” of the Antiquities Act occurred during their designation. Driving the review are desires to repeal recently designated Monuments, and to open lands to extractive and impactful uses where these activities are currently restricted. Changes to existing monument designations could come via an act of Congress. Most agree that changes via presidential executive order would be legally indefensible. CNPS will continue to defend federal public lands in California through science-based advocacy of our native flora, and as part of several environmental / conservation coalitions engaged in the conservation of natural lands, including National Monuments, across California. 1. Contact your Congressional Representative: If you are in the 27th District of California, contact U.S. Representative Judy Chu. Thank her for her work in getting the San Gabriel Mountains National Monument designated and then ask her to work to prevent the elimination or reduction in size of this and other national monuments. If you are not in the 27th District of California, contact the person who is your U.S. Representative. 2. Social media: Participate in social media expressions of opinion (suggested by Conservation Lands Foundation, conservationlands.org). Tweet @POTUS, @Interior, @SecretaryZinke with photographs taken in the national monuments and with a line expressing your opinion of potential deprotection of federal land. Post photos and opinions on Facebook and Instagram. CNPS is active at the state level in many conservation areas. Click here for the CNPS state web page. Congressman Steve Knight, who represents the 25th Congressional District, in July 2015 introduced a bill (H.R. 3153) into the House of Representatives to designate as wilderness about 70,000 acres in the northern Angeles National Forest, to be called the Castaic Wilderness. This is the largest remaining block of undisturbed, unprotected habitat remaining in the Angeles National Forest, and deserves the strongest and most durable protection that can be afforded to our public lands. Click the following links for: (1) Castaic Proposed Wilderness fact sheet, (2) map of the area. Your help is needed to ensure this bill is passed, — unfortunately, it is being vigorously opposed by those in the OHV and mountain biking community. If you live in the 25th Congressional District (which covers northern L.A. County and part of Ventura County, including the cities of Santa Clarita, Simi Valley, Palmdale, Lancaster, and the northern part of the San Fernando valley), please either call or send an email/letter to Congressman Knight expressing your support. Click here for a draft email/letter — do modify it if you wish, so that it looks as original as possible. If you wish to call, the number is 202-225-1956. All you need to say is your name, in which city you reside, and that you wish to thank him for introducing H.R. 3153, and that you support the Castaic Wilderness. In May 2015 the CNPS approved the formation of a new chapter, one that is not defined by a geographic region, but by a common interest in bryophytes, i.e. mosses, liverworts, and hornworts, which are the earliest evolved land plants. On the occasion of a CNPS Chapter Council meeting, CNPS SGM Chapter member Gabi McLean interviewed three CNPS members instrumental in the new chapter to find out about the nature of bryophytes and how the new Bryophyte Chapter will contribute to the conservation of these plants. Click here to view or download a transcript of this interview. On November 12, 2014 the County of Los Angeles Board of Supervisors certified the Final Environmental Impact Report (FEIR) for the Devil's Gate Reservoir Sediment Removal and Management Project, and directed the L.A. County Flood Control District to carry out the project based on the FEIR. Our chapter took a strong stand against the huge size and destructive nature of the project, which would remove millions of cubic yards of sediment at Hahamongna Watershed Park, and destroy over 50 acres of willow woodlands in the process. The Arroyo Seco Foundation (ASF) and Pasadena Audubon Society (PAS) are plaintiffs in a lawsuit to halt this project until a less destructive scale is implemented, such as the one drafted by the City of Pasadena. San Andreas SEA. Courtesy LA County Planning web site. 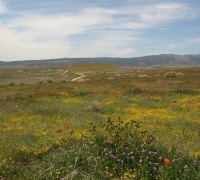 The Significant Ecological Area (SEA) Program is a component of the Los Angeles County Conservation/Open Space Element. This program is a resource identification tool that indicates the existence of important biological resources. SEAs are not preserves, but are areas where the county deems it important to facilitate a balance between limited development and resource conservation. Limited development activities are reviewed closely in these areas where site design is a key element in conserving fragile resources such as streams, oak woodlands and threatened or endangered species and their habitat. The intent of the proposed SEA regulations is not to preclude development, but to allow limited, controlled development that does not jeopardize the unique biotic diversity within the County. The SEA conditional use permit requires development activities be reviewed by the Significant Ecological Area Technical Advisory Committee (SEATAC). The original SEAs were designed and mapped in the mid-1970s and the Board of Supervisors adopted them in 1981. There are currently 64 SEAs, and some very small and boundaries not designed to include watersheds. The new proposed SEAs came out of a thorough study over 10 years ago and while there are less of them (27), they are generally bigger and combine some existing SEA's into better corridor-watershed approach to better include supporting natural resources. These new SEAs are under consideration for final adoption by the BOS as part of the County General Plan revision. The changes to the SEA procedures and letters from industry and public are at the link from LA County http://planning.lacounty.gov/sea/ordinance. April 1, 2013, was the comment deadline. Bottom line: everyone should support the new SEAs and tell Los Angeles County that they want the highest level of protection for them to avoid piecemeal disturbance that slowly weakens them. The Southern California National Forests (the Angeles, Cleveland, Los Padres, and San Bernardino National Forests) are developing a proposed amendment for the Land Management Plans (LMPs) adopted in 2006. The proposed amendment would revise land use zone allocations for select Inventoried Roadless Areas (IRAs) within the four forests and amend LMP monitoring protocols. This is a result of the Settlement Agreement approved January 3, 2011 for California Resources Agency, et al vs. United States Department of Agriculture, and Center for Biological Diversity, et al vs. United States Department of Agriculture. Scoping will begin with the release of a Notice of Intent to Prepare a Supplemental Environmental Impact Statement (EIS). One EIS will be prepared with a Record of Decision (ROD) for each Land Management Plan. This joint planning process will maintain the consistent management direction and format across the four Forests. For further information, see the special US Forest Service web page. The National Park Service is conducting a "special resource study" of the area known as the “Rim of the Valley Corridor.” This is the area that generally includes the mountains encircling the San Fernando, La Crescenta, Santa Clarita, Simi, and Conejo Valleys of Los Angeles and Ventura Counties in southern California. See the National Park Service web page for details. For current status, see the summary of comments and calendar of events in the NPS Newsletter No. 2, Summer 2011. The National Park Service is conducting a “special resource study” of portions of the San Gabriel River watershed and the San Gabriel Mountains. The NPS is extending the public comment period for the Draft San Gabriel Watershed and Mountains Special Resource Study and Environmental Assessment to February 13, 2012. There are several ways to comment. You can provide your comments online at http://nps.gov/pwro/sangabriel, you can send an email to pwr_sangabriel@nps.gov, or you can send a letter. For further information, see the NPS Special resource study web page. Sierra Club Montebello Hills Task Force: We will continue to fight the development of the The Montebello Hills, the last large area of open space left between the Los Angeles River and the Rio Hondo — approximately 480 acres. See the Sierra Club web page. Montebello Hills Specific Plan: The City of Montebello is currently processing an application for the Montebello Hills Specific Plan. The area encompasses the 488-acre property owned by Plains Exploration & Production Company (PXP), covering the Montebello oil field. The Montebello Hills property is located in the northeastern portion of the City of Montebello, near the cities of Rosemead and Monterey Park to the north, and unincorporated areas of the County of Los Angeles and the Whittier Narrows Flood Plain to the east. For details, see the City of Montebello web page. The Walnut Creek area encompasses approximately 60 acres of natural habitat and wildlife. This project area is important for its potential visitor recreation opportunities, open space values, ecological diversity, wildlife habitat, and native plant communities. See the City of San Dimas web page, and also the Watershed Conservation Authority's bulletin. The Los Angeles County Flood Control District (LACFCD) is no longer separately pursuing the development of the La Tuna Canyon Sediment Placement Site. See Urbanwild Network's page. The San Gabriel River Discovery Center is being developed to provide a hands-on, indoor and outdoor learning experience where more than 100,000 local students, families, and nature enthusiasts per year will learn the story of the San Gabriel River Watershed. Grant request rejected (see L.A. Times article of April 16, 2011): California State Parks authorities have rejected a request for a $7-million grant needed to begin construction on a controversial $22-million, 14,000-square-foot Discovery Center at the Whittier Narrows wildlife sanctuary in South El Monte. A small piece of land along the Arroyo Seco in South Pasadena was saved from development through the work of a group of determined citizens. In October of 2004 the three-plus acre nature park was opened to the public. See Weeding Wild Suburbia blog. Vulcan Materials Company or its subsidiaries owns several parcels of land in Azusa. Three parcels make up the 190 acres allowed for mining under the current Conditional Use Permit (CUP). Vulcan wants to expand the mining operation by adding the west-most 80 acres to a new CUP. See the Save Our Canyon web site. In Los Angeles County: The primary goal of the Los Angeles County Oak Woodlands Conservation Management Plan (OWCMP) is to develop a consistent policy for the management of oak woodlands that can be incorporated into the Los Angeles County General Plan and other relevant planning documents. Developing a comprehensive and cohesive strategy for dealing with loss and creating opportunities for recovering oak woodlands at a commensurate rate should be the focus of planning and community efforts. The OWCMP provides the platform to accomplish the following goal: “Oak Woodlands are preserved and restored so that they are conserved in perpetuity with no net loss of oak woodlands.” We understand that an implementation plan is under development. In the City of Arcadia: Early in 2011 an oak woodland in Arcadia was removed to make way for the dumping of sediment from Santa Anita Reservoir and other reservoirs in the area. Click here to see the letter we submitted to Los Angeles County Supervisor Antonovich.